Whether we’re talking about revolutionary new web services, IT systems to automate internal procedures, or products to sell in boxes, there are many different sorts of things that need to be done. We need to envision the product, decide what’s required to be done, design it, build it, make sure it works, and put it into production where we can reap the benefits. Except in the smallest of circumstances, doing all of these things requires the work of multiple people. And, given that we need multiple people, and that we need a variety of skills, it’s natural that some people specialize in some thing and others specialize in different things. But we can take that specialization too far. And if we over-specialize, then we do these different things in isolation. It’s like having a small box of crayons. 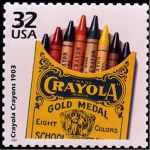 One person takes the red crayon, others orange, yellow, green, blue, and violet. With that, we try to create a glorious full-color work of art. It’s no surprise that’s hard to do. Colors in the real world flow from one named color to another, without a discernible boundary. It’s a continuous spectrum to which we’ve given names at certain approximate points. You just can’t draw the world as we see it using only six crayons. 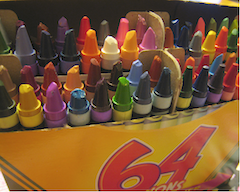 The typical corporate response is to add more crayons. And more people to hold those crayons. And more delays caused by passing things from one person to another. And… we still don’t get the picture we want. The more people we have, and especially the more specialists, the harder it is to get a pleasing cohesive picture. We don’t need to eliminate specialization, though. Just blur the boundaries a little. 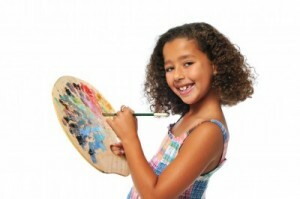 We can get the full-color rendition we want with our limited palette if we blend the colors where they meet. Rather than pass the work from one type of the work to the next, let the people doing those different types of work work together. They might even swap colors with each other from time to time. Odds are, they’ll do a much better job at producing the picture you want. This entry was posted on Monday, August 1st, 2011 at 9:35 AM and filed under Individuals and Interactions. This is great, George! As I read it, you also give us permission to specialize in generalization! I suppose that makes me the “smear stick”? That means Agile is a one man show, and it is only good for small/meduim projects. But not applicable for big/complex projects. No, Ahmed, it doesn’t mean that at all. People successfully using Agile on big/complex projects would be surprised to hear that conclusion. I’m curious how you got that impression. Do people not communicate effectively where you work? Can they not collaborate? Because it is difficult these days to be an expert in one field. And in complex projects you need more experts than in simple ones. And the more experts you have, the more “passing things from one person to another”. He arrived at that conclusion long before he read your post.